The 20th edition of the Dollar General Bowl will host the matchup between the MAC Buffalo Bulls and the Sun Belt TroyTrojans, and this will be the first head-to-head duel between these two schools. The Bulls are listed as 2-point favorites here with the total at 49.5points and the Trojans at +105 money line odds. The Buffalo Bulls (10-3; 9-4 ATS) will appear in a bowl game for the third time in their history after losing toConnecticut 38-20 in the 2008 International Bowl and San Diego State 49-24 inthe 2013 Famous Idaho Potato Bowl. The Bulls are coming off a painful 30-29defeat to Northern Illinois in the MAC Championship Game, and it was theirsecond defeat in the last three games following a 52-17 loss at Ohio. However,the Bulls are enjoying a great season so far, and are among the best teams inthe country against the spread. The junior QB Tyree Jackson is leading the Bulls with 2857 yards, 27 touchdowns, and 11 interceptions, completing 55.1% ofhis passes. The RB duo Kevin Marks and Jaret Patterson combined for 1751rushing yards and 25 touchdowns, and these two guys are a huge threat off thebackfield. The senior Anthony Johnson is leading the receiving corps with 52receptions for 944 yards and 11 touchdowns, while junior WR K.J. Osborn added49 catches for 835 yards and six touchdowns. The Bulls are averaging 34.8points (26th in the country) on 417.6 total yards per game (53rd), allowing24.7 points in a return (48th) on 349.4 total yards per contest (31st). 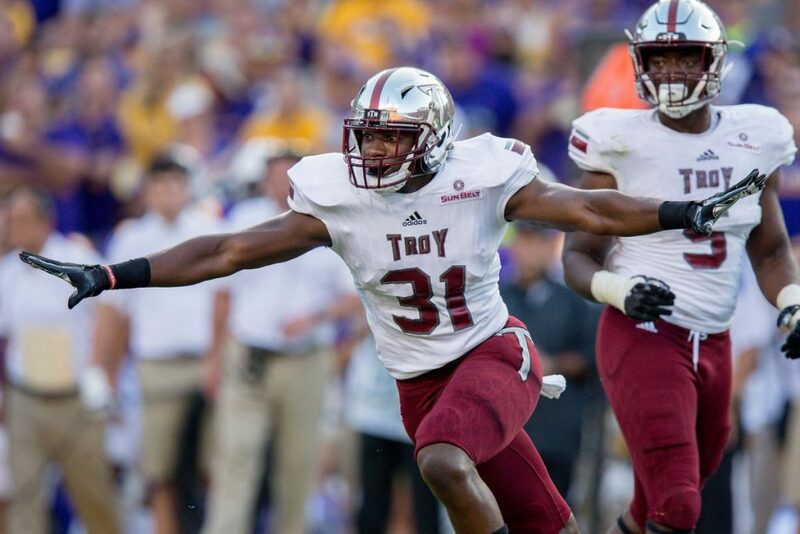 The Troy Trojans (9-3; 7-3-2 ATS) have earned their third straight bowl appearance and will be looking for the third consecutive victory after winning the 2016 Dollar General Bowl and the 2017 New Orleans Bowl. This will be their second partaking in the Dollar General Bowl following a 28-23 victory over Ohio two years ago, while the Trojans are 4-3 in their seven bowl games so far. The Trojans have ended the regular season with a 21-10 defeat at Appalachian State that put an end to their four-game winning streak. After Kaleb Barker’s season-ending injury, the sophomore QB Sawyer Smith led the Trojans with 1349 yards, 10 touchdowns,and six interceptions, completing 61.1% of his passes. The junior RB B.J. Smithis the main force out of the backfield with 199 carries for 1093 yards and 12touchdowns, while Sawyer Smith added 69 totes for 192 yards and a TD. DamionWillis is leading the receiving corps with 43 catches for 775 yards and eighttouchdowns, while Deondre Douglas has 44 receptions for 437 yards and seventouchdowns. The Trojans are scoring 29.8 points (59th in the country) on 385.5total yards per game (80th), allowing just 21.2 points in a return (23rd) on345.6 total yards per contest (28th). This should be a great battle as we’ll seethe Bulls’ prolific offense against the Trojans’ sturdy defense. In their last eight showings, the Troy Trojans have limited their rivals under 23 points including two games when they were beaten by Appalachian State 21-10 and Liberty Flames22-16. On the other side, the Bulls have surpassed the 43-point mark in three of their last five games, and they’ve scored less than 20 points only once this season. The Bulls’ pass defense has been doing a good job lately, but their run defense could easily struggle against the Trojans. I expect to see a reallyclose game where one mistake can decide a winner, and I’ll take the Bulls justbecause of their efficient attack that could make a difference down thestretch. The game opened at 53.5 points, but the adjusted line makes this wager pretty tricky. Both teams play good defense, especially the Trojans who rely on their stops. As I’ve already mentioned, it is tough to score a bunch of points against Troy’s defense, so I’ll take the under on this one. We should see more than 40 points in the total, and hopefully, these two sides won’t surprise with a few pick and six that could edge the game into the over.